Received this beauty last week, this particular one is a 'b-stock' scratch and dent made of tumbled titanium. I rather like the little 'imperfections' and lends it's own personality. 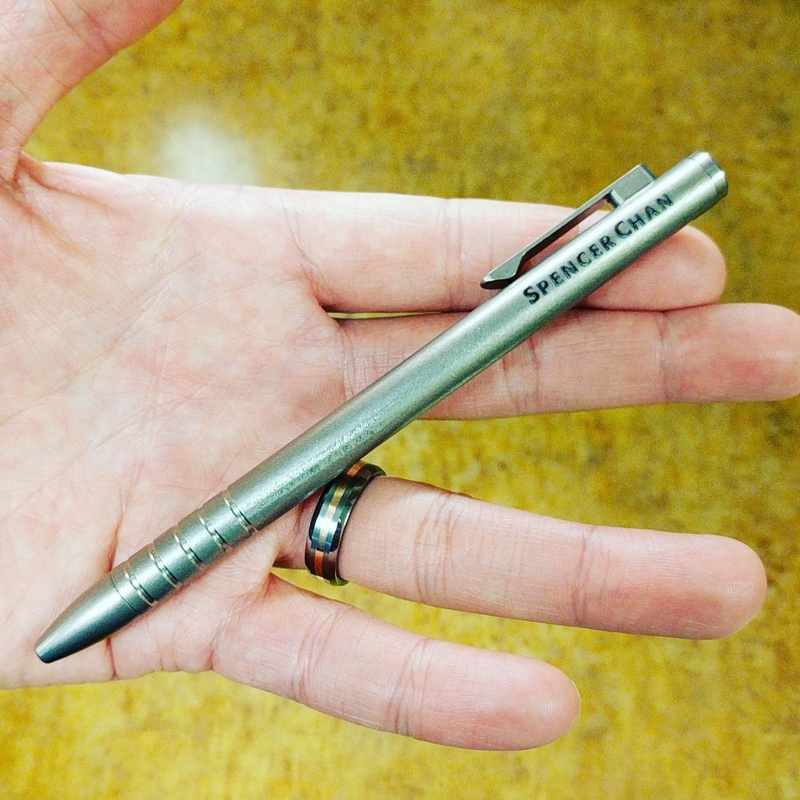 It uses a pilot G2 refill, but the company had a conversion kit to use Parker style refills which I am using to fit a Fisher Space Pen insert in it. Looks nice Spencer. Can you please post a picture of the other side, so we can see how the bolt mechanism works? I understand that the clip is the bolt. I like the look of the tumbled titanium. 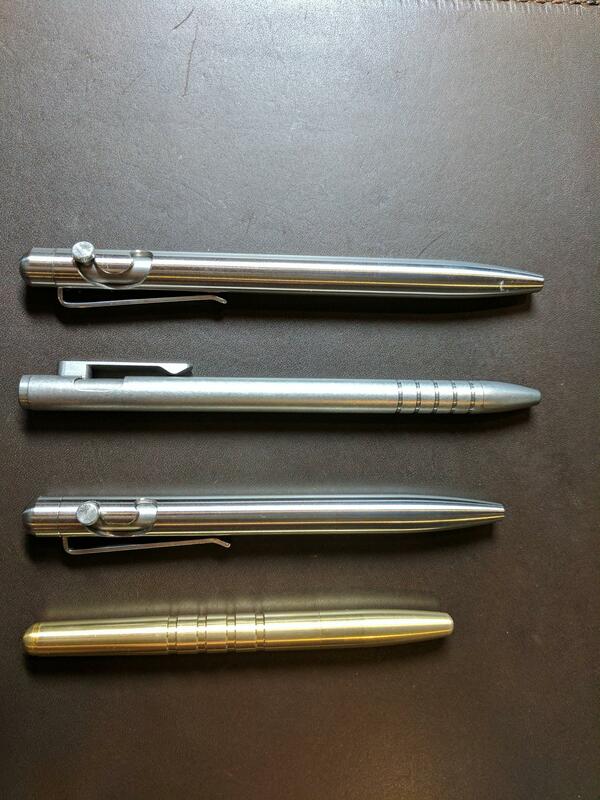 It's similar to the tumbled aluminum of Karas Kustoms pens. (07-14-2017, 10:15 AM)TheLegalRazor Wrote: Looks nice Spencer. 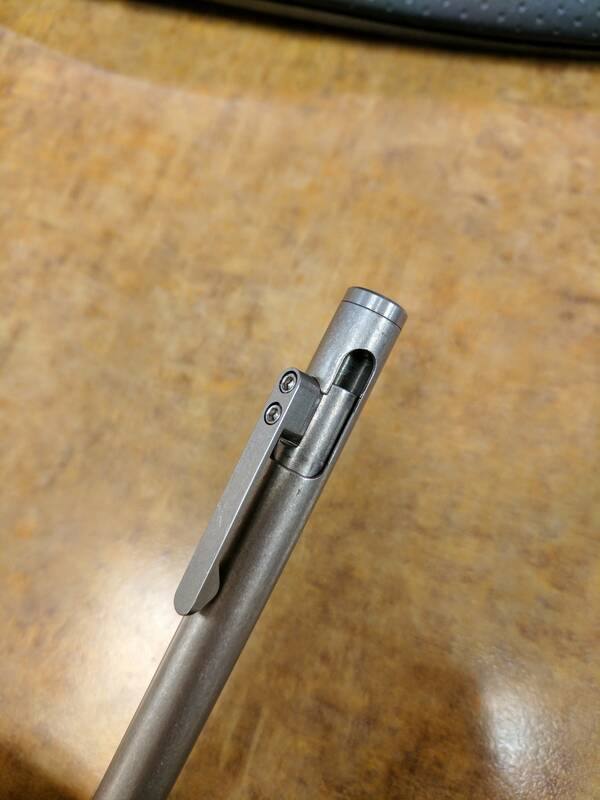 Can you please post a picture of the other side, so we can see how the bolt mechanism works? I understand that the clip is the bolt. I like the look of the tumbled titanium. 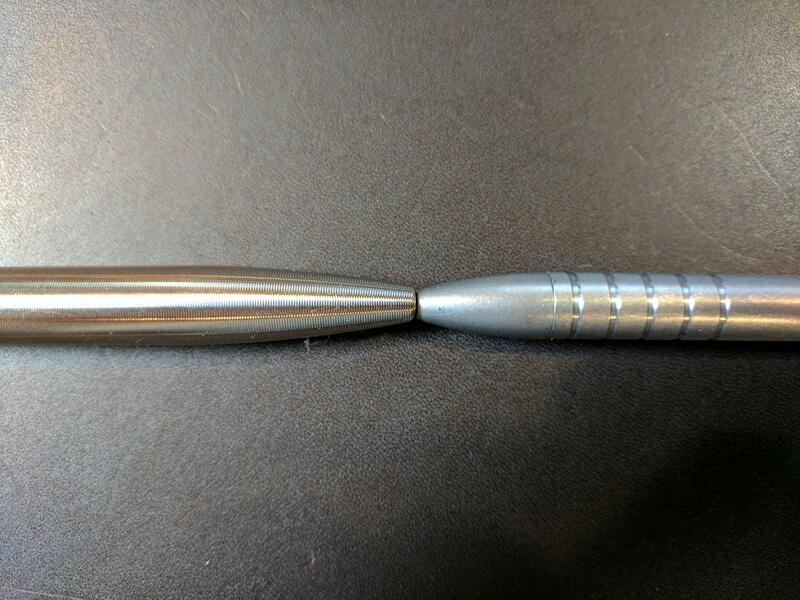 It's similar to the tumbled aluminum of Karas Kustoms pens. I should have done that first! 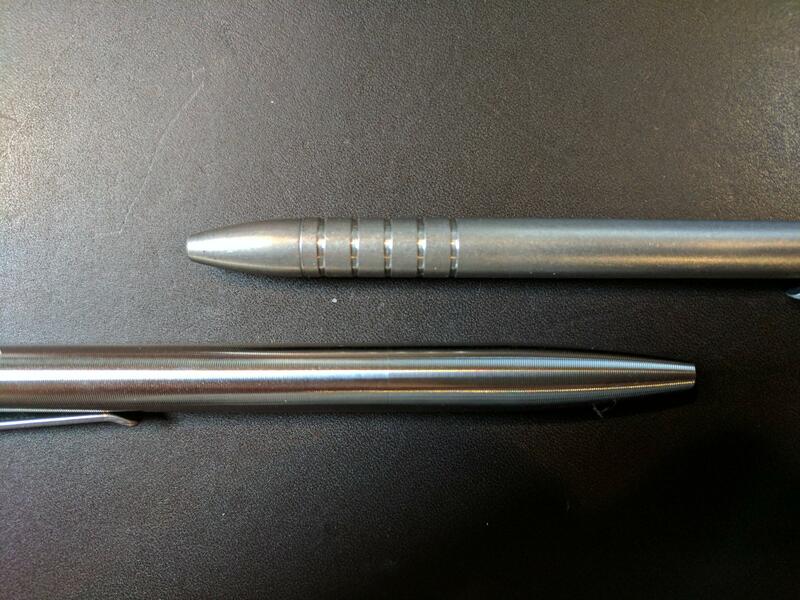 The clip is attached to the bolt and the clip is machined so that it doesn't touch the barrel so there are no scratches on the pen body. Indeed, the clip is the bolt! Cool design. And the close up pictures confirm I like the tumbled titanium. Great acquisition! Very cool design! Thanks for sharing Spencer. (07-14-2017, 10:27 AM)TheLegalRazor Wrote: Indeed, the clip is the bolt! Cool design. And the close up pictures confirm I like the tumbled titanium. Great acquisition! (07-14-2017, 10:46 AM)eengler Wrote: Very cool design! Thanks for sharing Spencer. No problem guys. 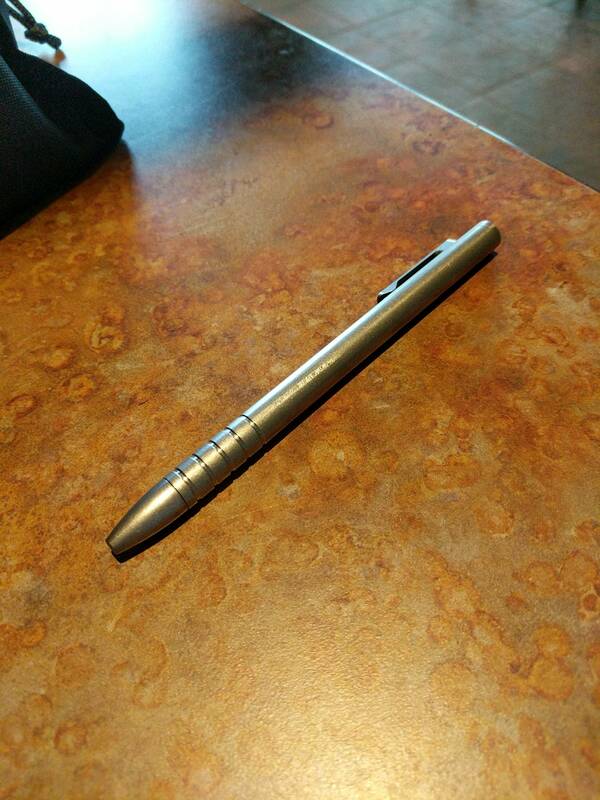 My favorite thing about this pen is how light and comfortable it feels in hand. 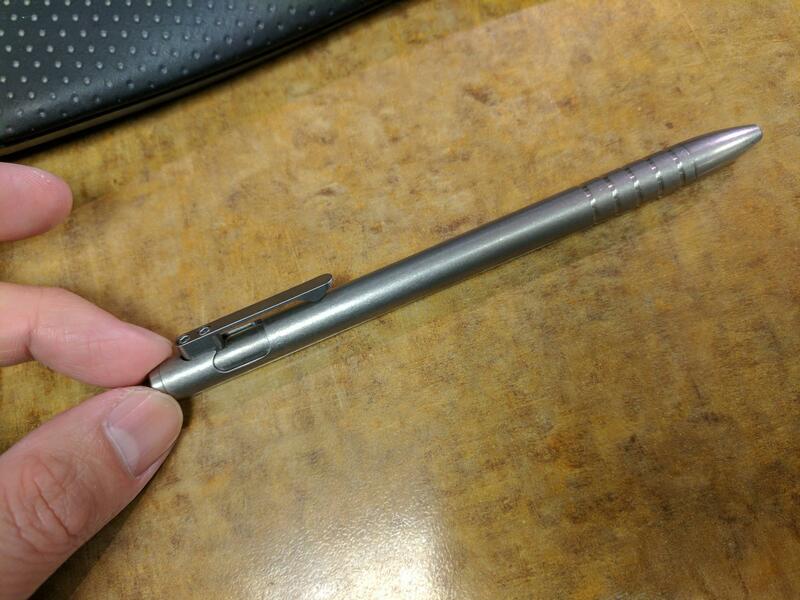 It feels like a more solid 'regular' pen. (sometimes I feel like I overgrip my tactile turns and my hand starts to ache). The creater focused on minimizing the weight and diameter of the barrel to make it something that's as lightweight as possible. Spencer, could you please post a picture of it next to a Tactile Turn Slider or Glider? I want to see if the barrel is on yours is noticeably slimmer. Thanks. (07-14-2017, 01:55 PM)TheLegalRazor Wrote: Spencer, could you please post a picture of it next to a Tactile Turn Slider or Glider? I want to see if the barrel is on yours is noticeably slimmer. Thanks. Yes noticeably. I would say about 1/3 slimmer. Thanks for the pictures Spencer. They're helpful. Very nice touch Spencer. Who does the engraving for you? (07-20-2017, 01:04 PM)TheLegalRazor Wrote: Very nice touch Spencer. Who does the engraving for you? A local gun shop who has a nice fiber laser has been doing the work. I've gotten more than a few things from them in the past.